The cost of rice has risen up to 50 percent on world markets, raising concerns among aid agencies in Asia. The agencies say they are facing shortfalls in efforts to feed the hungry in the region. VOA's Luis Ramirez reports from Bangkok. 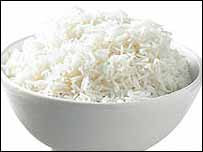 The price of rice on world markets has doubled since 2004 and in the past two months alone has gone up 50 percent. Rising fuel and fertilizer costs, and natural disasters are fueling the price hikes. The rising costs have triggered warnings of unrest in the Philippines. Cambodia and Vietnam have cut their rice exports, actions that analysts say threaten to push prices up even further in the coming months. The World Food Program (WFP) recently launched what it said is an extraordinary emergency appeal for donor nations to increase their donations. The agency says it faces a $500 million shortfall, $160 million of that in Asia, a situation that officials say may soon force them to start cutting rations. WFP officials say they are searching for ways to cut transportation and other non-food costs. They say one way is to develop means of purchasing and processing food in the countries that receive the aid, rather than have to transport it from far away places. World Food Program officials say their ability to feed people has dropped significantly in the last few months. As an example, officials say that just last year, $15 million could buy 189,000 tons of food and feed 3.5 million people in Afghanistan. Now, they say the same $15 million allows them to purchase only 112,000 tons to feed 1.9 million people.